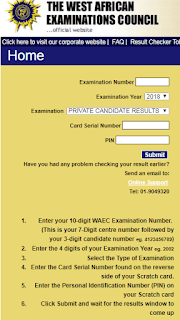 January/February WAEC First Series Exam, WASSCE for Private Candidates (popularly known as WAEC GCE) that their results are now accessible online. 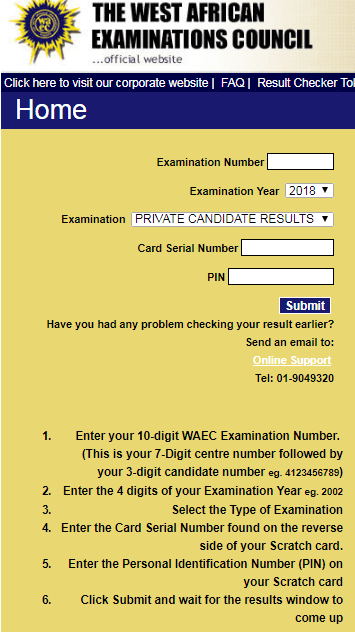 2018 WAEC First Series Results have been successfully transmitted online and it is available from the WAEC official result checking website. Candidates need to acquire the WAEC result checker which cost N500 (five hundred naira only) from accredited dealers or any WAEC office nearest to them to be able to access their results. 1. Visit the WAEC First Series result checking portal @ www.waecdirect.org. 5. Type in the Card Serial Number found on the reverse side of your Scratch card. Note: Make sure you adhere closely to the format above. There should be no space in the message. How to Check WAEC Result Using Phone With Out Internet. How Long is WAEC Result Valid? The certificate issued by the examination body (West African Examination Council) is valid for life. WAEC conduct achievement test which remain valid forever. unlike UTME which conduct selection test that is valid for a particular academic year. Please note, upgrading of waec result is false, if any one promise to help you upgrade your waec result, note that you are in for a scam, upgrading of waec result is not possible. do not be a victim. Do not listen to their fake testimonies and call their fake phone number. If you are already a victim, please recheck your result online, to see that it is not possible. do not be a victim to internet fraud. Hint: you can only use your result checker five times, so be wise!